INTRO TO THE "STATE OF THE STUDIO"
The "State of the Studio" posts document what's happening in the studio from a birds-eye view, putting all of the bits and pieces from the blog, sketchbooks and other snippets shared here and on social media together into a bigger picture. It's a good way for me to keep you in the loop on what's going on project wise and giving you a better idea of how I work in terms of a longer term schedule. 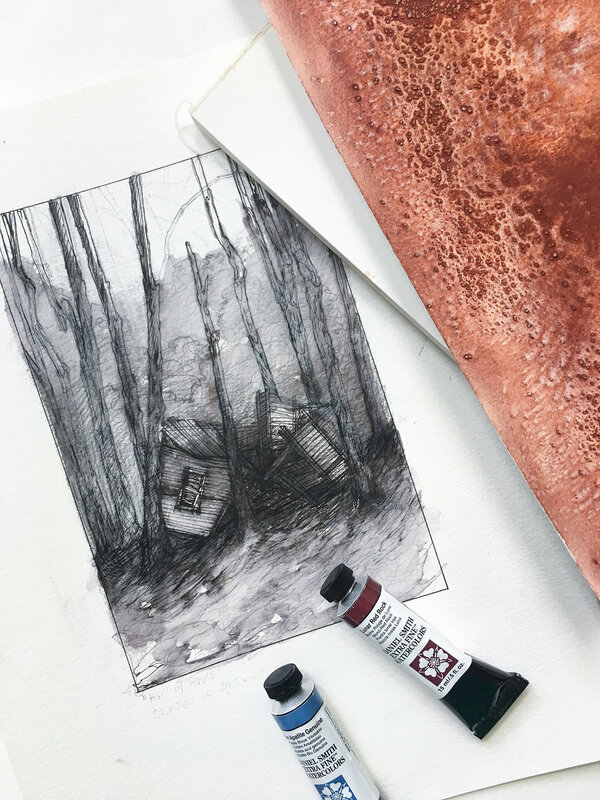 In this edition you'll find out how the new studio space is shaping up, get a sneak peek at sketches for new large scale work and also find a really exciting announcement for a new project coming this fall! Study for a drawing based off images taken in Silver Point, TN. After moving into the new house last year it took a lot of time to figure out how I was going to set up the new studio and shop (on top of figuring out what to do with the rest of the house, but thats another story). The house was originally an old hunting camp in the mountains and has been added onto several times over the years, so there are lots of interesting character in the layout. Luckily the move has allowed me to almost triple my working space with the the addition of a separate woodshop. This space has allowed me to create a more fluid working process from the early stages of panel prep to finishing and framing. The new studio has tons of natural light and the additional space has opened up the opportunity to comfortably work on multiple large scale projects at once. Currently I’m building an adjustable wall-mounted system to hang in-progress work on and a cork wall for studies and reference photos. In the near future I’ll be removing the old flooring, redoing trim work, adding better lighting and repainting the walls. I'll also need to resolve a shortage on flat file storage (but seriously though what drawer/printmaker isn’t in that boat?) and build storage racks/shelves for the closet as well as larger desks to increase table surface. I’d also like to add a small seating area, but that will definitely be down the road a bit. There's still a lot of work ahead, but for now I'm extremely happy with the new space and how it's finally starting to come together. I've got that large scale work wild hair again (not that it every really left in the first place) and getting back to working on some big drawings feels good. When you work large scale its a very physical experience, your whole body is involved and you get to move more than if you are focusing on a smaller work. There's also a lot of problem-solving that has to take place, which makes for some interesting tool choices. The downside to larger drawings is that they are a lot more time consuming, which means they usually turn into several month long projects versus smaller work which can take anywhere from a few days to a few weeks. Progress always feels super slow and it's much harder to keep that initial motivation after the two month mark. In the end it's all worth it though, because I love the way large work shows and how it commands a space. 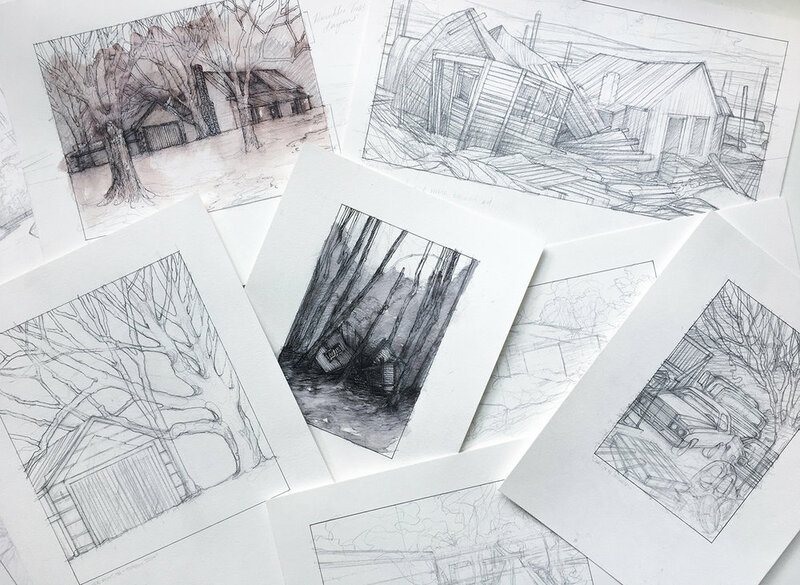 Can’t wait to start sharing more of the process and behind the scenes with you as things start to take shape, but for now you can check out the images above for a few of the first composition sketches for work that will be taking shape over the next few months. Ink washes are great because they help you see value shifts and identify the light source, especially if you are working from multiple images like I do. I have this bad habit of taking one thing off my plate and then adding another, so later this year I’ll be launching the Drawn South Project. I’ve been simmering on this project for a few years and now felt like the right time to bite the bullet. One of the main things I enjoy about my studio work is that it brings rural culture into the fine art world, but unfortunately the time and process devoted to making my larger work often means that the price reflects that. Once you add in the materials and potential gallery commission, it's not too often that the people I ultimately make work for or about can’t afford to purchase one. The Drawn South Project is meant to bridge that gap. It's a documentary style project launching this fall that will make a portion of my work more accessible. This project will represent various landmarks around the Southern Appalachians in a smaller scale format that can be presented individually or grouped together to create a gallery wall. The smaller scale means they will cost less to produce, keeping them in a much lower price range than the larger scale work. The tentative launch date is the middle of October, so keep an eye out for sneak peeks and official launch announcements over the next month or two over on Instagram. Hope you're as excited as I am about all of the things happening in the studio! What are you most excited to see as it takes shape over the next few months? To keep up to date you can subscribe via rss in the link below. I'll also be adding an email subscription and newsletter later this month too, so keep your eyes open for that option soon. For more day to day posts, follow me @carlyddrew on Instagram.